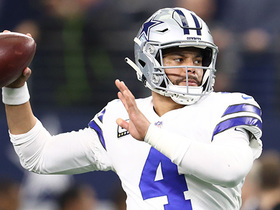 Analysis: Although Gallup finished second on the team in targets, he struggled to get on the same page as Dak Prescott for much of the game. The duo did connect for an 11-yard touchdown just before halftime, swinging Dallas ahead entering the second half. Gallup made an impact in his first career playoff game, but he'll likely need to produce more efficiently next week, with either the Rams or the Saints on the docket. Analysis: The goose egg comes one game after the rookie drew a season-high nine targets in a win over the Eagles, although he was only able to turn them into four catches for 24 yards. 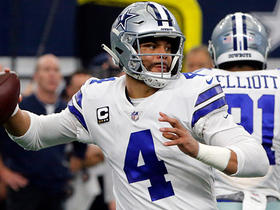 Gallup has shown flashes of his upside this season, but for the most part he's struggled with his consistency and has yet to develop strong chemistry with Dak Prescott. Look for significant improvement from the young receiver in 2019, especially with Amari Cooper remaining the focus of attention for opposition secondaries. Analysis: Gallup was held out of Friday's practice while dealing with the ailment, but it wasn't serious enough to force the first absence of his rookie campaign. The Colorado State product should continue to earn regular snaps on offense at receiver alongside Amari Cooper and Cole Beasley, a role that has translated to an average of 5.3 targets per game over the Cowboys' last six outings. Analysis: The ailment that prevent Gallup from practicing Friday apparently isn't too serious in nature, so after getting Saturday off to recover, the rookie should be ready to fill a regular role in three-receiver formations alongside Amari Cooper and Cole Beasley. Gallup is coming off a big game in the Week 13 upset win over the Saints during which he hauled in a career-high five balls for 76 yards, while he draws a favorable matchup against an injury-depleted Philadelphia secondary. Gallup didn't participate in Friday's practice due to an illness and is listed as questionable for Sunday's game against the Eagles, David Helman of the Cowboys' official site reports. 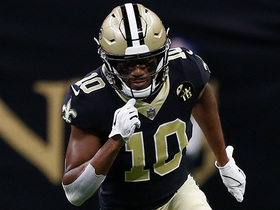 Analysis: The ailment isn't a major concern for the rookie wideout, with Todd Archer of ESPN.com relaying that the prevailing belief is that Gallup will be ready to go come Sunday. With averages of 2.6 receptions, 45.2 yards and 5.3 targets per game over the Cowboys' last six outings, Gallup seems to have inched ahead of both Cole Beasley and Allen Hurns as the top complement to clear No. 1 receiver Amari Cooper. Gallup brought in five of seven targets for 76 yards in the Cowboys' 13-10 win over the Saints on Thursday. 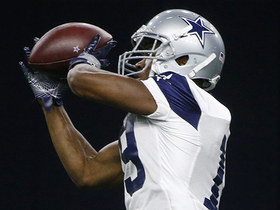 Gallup caught two of six passes for 19 yards during Dallas' 31-23 Thanksgiving win over Washington. Gallup (personal) rejoined the team Wednesday and will be available to play in the Cowboys' Thanksgiving Day game against the Redskins, Kate Hairopoulos of The Dallas Morning News reports. Gallup (personal) said he intends to play in Thursday's game against the Redskins, Brandon George of The Dallas Morning News reports. Gallup may miss Thursday's game against Washington while attending to a family matter, Clarence Hill of the Fort Worth Star-Telegram reports. 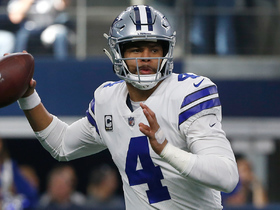 Analysis: Gallup received some unfortunate news after Sunday's 22-19 win over the Falcons and didn't travel back to Dallas with his teammates. It's unclear if he'll be available for the Thanksgiving matchup with Washington. Gallup caught only one of five targets for 10 yards in Sunday's 22-19 win over the Falcons. 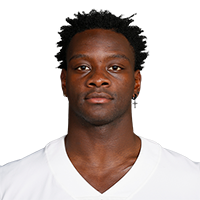 Analysis: While he's been seeing a fairly healthy volume opposite Amari Cooper (14 targets in three games), Gallup has only turned them into six catches for 95 yards. The rookie still has value in dynasty formats, but his short-term production in a run-heavy Dallas offense figures to be erratic at best. Gallup caught two of three targets for 34 yards during Sunday's 27-20 win over the Eagles. Analysis: Gallup looked like he was growing into a solid No. 2 for Dallas in recent weeks but fell off a little on Sunday. Part of that can be attributed to Ezekiel Elliott's six catches out of the backfield. The passing game is also shaking itself out with Amari Cooper now leading the show. Outside of Cooper, Gallup is still the most dangerous threat in Dallas' passing game and will enjoy a favorable matchup Sunday against a bottom-three Atlanta pass defense surrendering 292 yards per game. Gallup caught three of six targets for 51 yards during Monday's 28-14 loss to the Titans. Analysis: Gallup was coming off a career game, but his role coming into Week 9 seemed murky with Amari Cooper's debut. 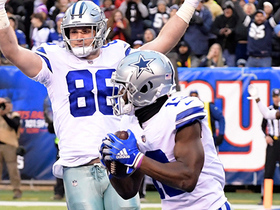 In the end, Cooper led Dallas in receiving statistics on Monday, but Gallup still managed to set a season high with six targets. If Monday proves to be the pattern Dallas' passing attack follows through the season, Gallup looks to be the Cowboys' WR2 with some more favorable matchups as defenses focus on taking away Cooper. A visit to Philadelphia's 25th-ranked pass defense comes Sunday. Dallas Cowboys quarterback Dak Prescott spots wide receiver Michael Gallup in back of the end zone for a two-point conversion. Dallas Cowboys quarterback Dak Prescott throws a 4-yard touchdown pass to wide receiver Michael Gallup against the Tampa Bay Buccaneers. 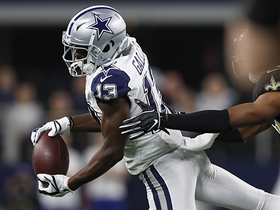 Dallas Cowboys quarterback Dak Prescott's pass intended for wide receiver Michael Gallup goes high for a near pick six. Dallas Cowboys quarterback Dak Prescott runs 13 yards for a first down. 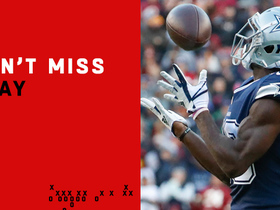 Dallas Cowboys wide receiver Michael Gallup makes a picturesque grab for 13 yards. Dallas Cowboys quarterback Dak Prescott passes to wide receiver Michael Gallup for 40 yards. 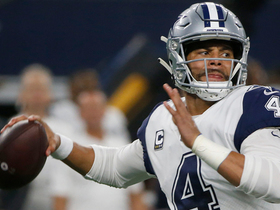 The "NFL Fantasy Live" crew give their bold predictions for the "Monday Night Football" matchup between the Tennessee Titans and Dallas Cowboys in Week 9 of the 2018 NFL season. 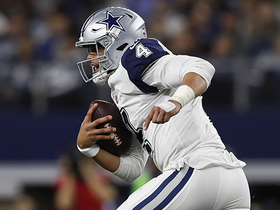 Dak Prescott delivers perfect throw for wide receiver Michael Gallup to score his first 49-yard NFL touchdown.